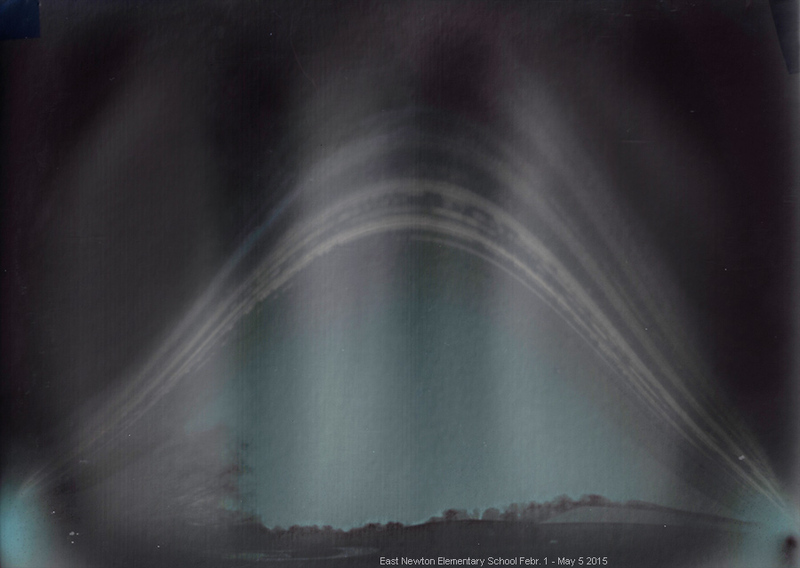 May 5th we did retrieve the pinhole camera at East Newton Elementary school. Everyone was excited to find out what the camera had recorded between February 1st and May 5th. Here is the result and one can nicely see the path of the Sun through the sky, the sunny and cloudy days, as well as days with some scattered clouds. The reording period started off with a number of cloudy days. (See the lower end of dark arcs at right). We would like to thanks Mrs. Thompson for arranging for us to bring this project to her school. This was our 6th year of Solar Outreach at Anna Ruby Falls. 9 of our members did participate with 10 scopes. Frank did let the visitors see Venus in bright day light which not many expected. The Sun showed two small spots but a few large filaments did dress up the sun very nicely for this event. About 500 visors did get to see and learn today what happens on the Sun. A number of them were very excited and told us they will for sure pay us a visit at one of our meetings and observing sessions. A great event and thanks the Michels, Marie and Tim Lott, Bob Jacoby and Dominic, Mark Dove, Frank Garner with his greandaughter and friend, and Theo for coming out to this great spot in North Georgia to show the visitors what’s up there in daytime. Click the image to go to the Gallery for more pictures and an image of the Sun taken at the event. The end of the school year nears and the students still need to see the result of what the pinhole camera captured to really see the path of the Sun throughout the year. The first school I retrieved the pinhole camera from was the Theme School at Ficquett in Covington. The pinhole camera recorded the path of the Sun from January 19th until today May 1st. 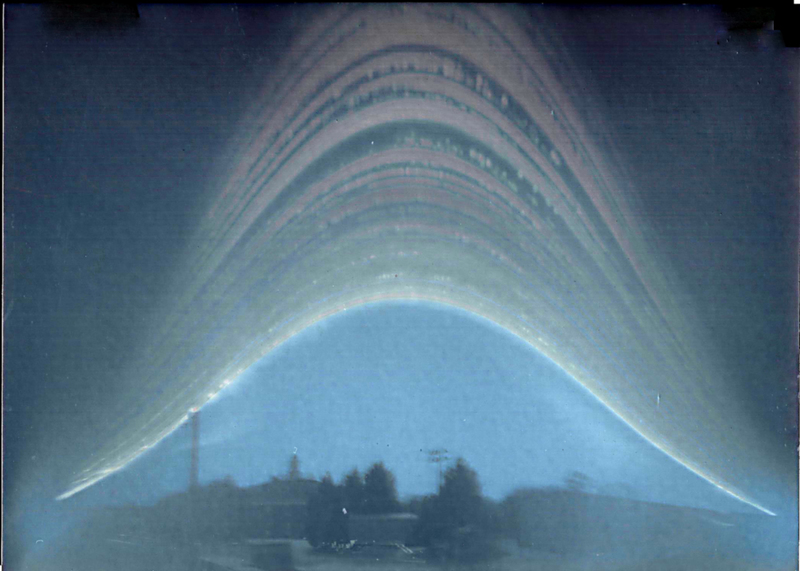 The image shows nicely the arcs of the Sun and recorded the sunny days, and hours, as well as the cloudy and rainy once. In addition, one can see nicely the surrounding buildings as well as the Newton County Schools Administration Building. Thanks to Mrs. Tamburro and the Staff at the Theme School for letting us help to bring this program to their Students. □ Clarify the roles of Club elected Officers. □ Adding a new position to oversee the clubs Facilities and equipment. □ Adoption of an annual operating planning process and budget. □ Overhaul of the chapters Outreach program to better balance our commitments with volunteer capacity to support. Steve invited all members to get involved and propose changes to the by-laws for consideration by the board. Proposed By-laws will be finalized and communicated to chapter membership within the next 2 weeks for consideration. The new by-laws will be submitted for membership approval at the May club meeting. Steve also reminded attendees that annual officer elections will occur at the May meeting and asked for nominations to be submitted to Steve. He also announced the existing officers have volunteered to serve another year. Steve then reminded attendees that CE officials have elected to install a locked gate at the entrance to the observing field. The code to the lock will be provided to all paying members. Lastly, Steve reminded that it is time to renew dues and urged all members to do so as soon as possible. An updated membership roster will be placed on the clubs web site before the May meeting. John Towne, Observing Supervisor, delivered the ‘What’s Up’ presentation featuring the Constellation Virgo. John’s image of the Pleiades was featured as our image of the month. Johns presentation is available on the clubs website. Congrats to all for their accomplishments and hard work! The meetings keynote speaker was club member Tim Geib who delivered an informative and wide ranging talk on astrophotography including discussion of equipment, data collection (taking pictures) and post processing techniques to extract all the detail possible from the final image. His presentation is on the clubs website. 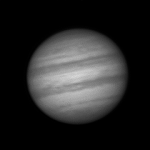 Unfortunately, our string of cloudy nights and bad weather precluded observing on Jon Wood Astronomy Field. The next meeting will take place on May 16th at 6:30 pm. The April meeting conveyed at 5:00 PM EDT at the Charlie Elliott Wildlife Center. Thirty-four members and guests were in attendance. Steve Siedentop started the meeting promptly at 4:30 p.m. Observing Supervisor John Towne was not in attendance due to work commitments, but made his presentation and target list available for download on www.ceastronomy.org Jack Fitzmier extolled the virtues of the Astronomical League’s observing plans and presented awards. Valerie Whalen gave an update on the state of outreach and asked for volunteers for two upcoming events. Shortly thereafter, members and guests in attendance enjoyed good food and good company while Jack gave a book review. Steve Siedentop announced that the next meeting would be April 18th, 2015 at 5 pm. Thirty-four members and guests were in attendance. I received this thank you note from Mrs. Veasey in regard to our outreach last Friday after she received the “quick Jupiter image”. That is incredible. 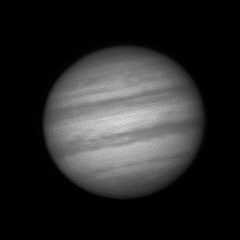 I don’t think I have ever seen Jupiter in such detail. Breathtaking! Thanks again for bringing all your people and scopes and presentation and expertise to make our astronomy night the best ever! We really appreciate what your club does for us. I hope that you are able to do this for many groups, as you provide such an amazing service to the community. Some people have never had any opportunity to see anything like this, and you open up worlds to them. Soon we’ll have to start thinking about next year’s date. The calendar person at the school always wants things like this on the calendar by the end of the school year! Friday night was so beautiful. We lucked out! Mother nature was very cooperative. Astronomy Night for Summerour Middle was postponed from the end of February to March 6th. And what a night it was! We had 9 members and 6 scopes at the school. About 100 students and parents learned about what astronomy really is about, and were able to see some nice views of the night sky including Jupiter and its moons, the Orion Nebula, our Moon and some star clusters. Frank treated the early birds to a view of Venus in full day light and inside we presented several presentations of the solar system by taking everyone on a trip in our imaginary space craft and observing the planets close by. They also were very surprised to learn about another take on gravity and what it really takes to take humans to Mars. A great and successful evening again. Thanks to all who participated!